Taste test: These are some thoroughly awesome potato chips (one of more than 1600 varieties of potato chips that we've reviewed). They're a clear standout among the other good Rap Snacks varieties that I've tried, and they're definitely among the top potato chips available today. 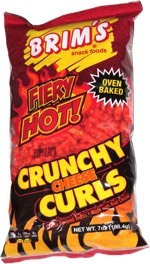 They're extremely crisp and have a ton of really good cheddar flavor that really stands out, with a nice kick of heat mixed in. 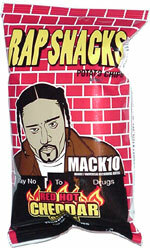 The amount of heat seemed to vary from chip to chip, as did the amount of deep red flavor powder. If you like cheese on your potato chips, get yourself some of these — you won't be disappointed. Smell test: Sort of the smell of hot chips, but not actually a hot smell.